God I love baseball. It's the greatest American sport because it is a big fat apple pie baked with all the most American ingredients: quasi-athleticism, belts, anthems, expanses of green grass, bubble gum, sitting around, boozing, and fresh air. It's the only sport I know where players can eat food while they're playing. I've loved it forever. Loved it longer than I've loved birding, in fact. But that's another great thing about Major League Baseball - it treats birds pretty well. 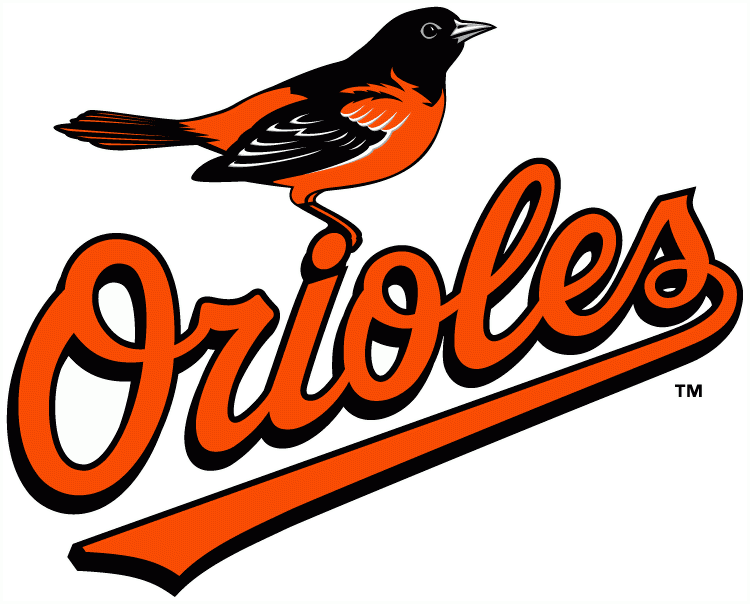 There are three MLB teams named after birds: The Baltimore Orioles, the Toronto Blue Jays, and the St. Louis Cardinals. First, these are great choices because they're specific. No invented baloney "Thunder Falcons" or anything, not even generic "hawks" or "eagles." These are classic, small, passerines. These are real birds. In addition to the names of the teams, the logos do these birds justice. For the most part they're accurate, ornithologically speaking. For the most part, but not completely. I wanted to take this opportunity to offer some edits to the logos of bird-named MLB teams, to see how different they'd look if given full respect to their avian inspirations. Let's see how it'll look. The Blue Jays have a beautiful set of logos. They'd tried to "toughen it up" a couple years ago, using logo showing an animated Jay angrily gripping a ball...but everyone knew it just wasn't them. The side-facing Jay with the split blue and white lettering is the Blue Jays, and it came back to stay. I grew up with them in powder blue, and I wouldn't mind it that came back full time. 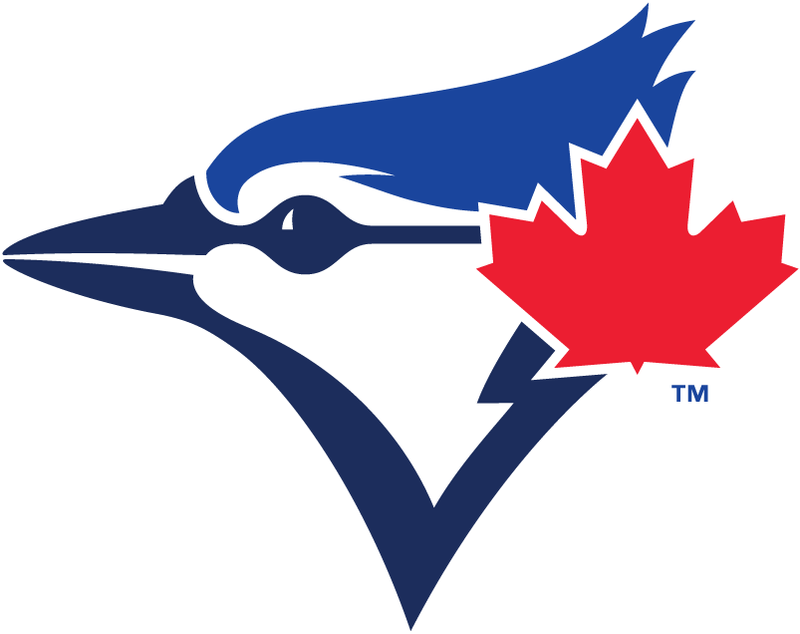 Anyway, the Jays logo, frankly, takes few liberties with the actual Blue Jay. 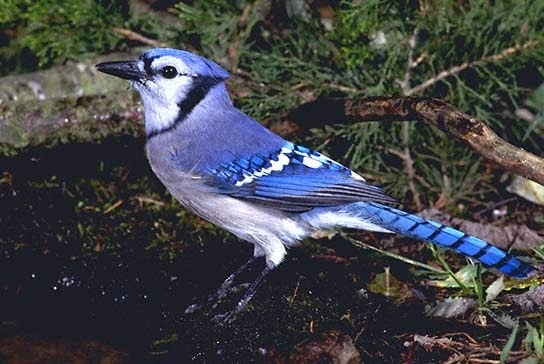 The biggest difference - the only difference - is that the bill and neck stripe of the Blue Jay is black. Well, the bill for sure. The neck stripe is a bit tougher to see. It's interesting, Blue Jays are such an easily-identified bird that field guides don't seem to pay much attention to the details. It's tough to tell whether the neck is a midnight blue or a black, but most images see it as black, so I'll go with that. A simple shift leads to a slightly different logo. Interestingly, the Jays had shifted to black uniforms a few years ago, part of the "black for black's sake" (or BfBS) uniform trend highlighted by UniWatch. The Jay's black uniforms were roundly criticized, partly because black wasn't a traditional part of their color scheme. 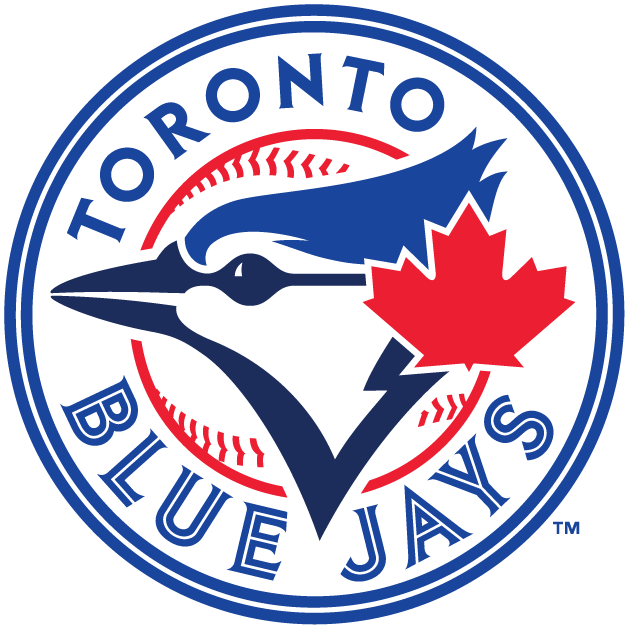 If the Blue Jays had simple changes their colors to more accurately reflect real Blue Jays, they could have adopted black uniforms with no problem. Alas. One of the oldest and most storied franchises in pro baseball, St. Louis has been making cardinals cool for decades. 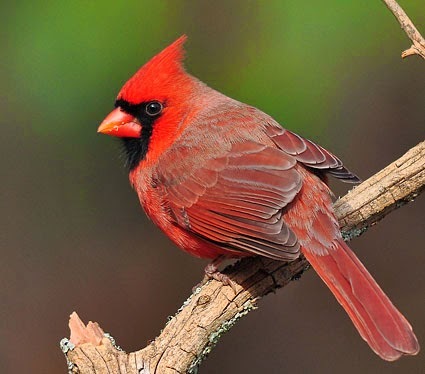 Northern Cardinals are an interesting case, they're not an intimidating or tough bird, but they're so colorful and common that they're one of the few birds that everyone knows. As I've covered before, despite their ubiquity Northern Cardinals are frequently misrepresented in broader culture. No one can seem to get the colors right, mostly insisting that they have bright yellow beaks. They don't. They just don't. These are the three logos from the SportsLogos.net website. 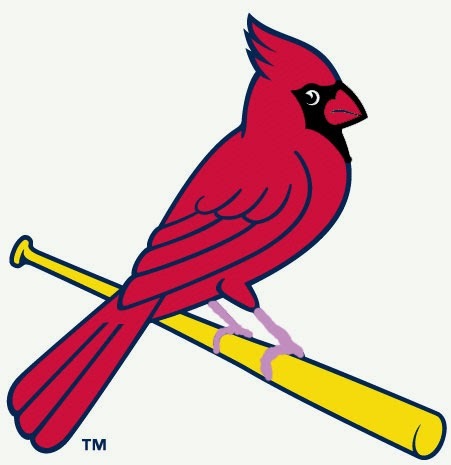 Note that the bibs of the two birds on the bat are blue, while it's represented - accurately - as black on the mascot. 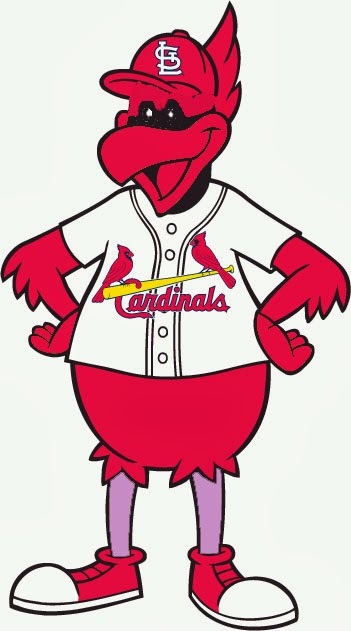 Overall the St. Louis Cardinals logos are pretty accurate, but there are minor changes. Northern Cardinals legs are pink, not blue. Their bills, for the love of God, are red. Their bibs are black, not blue. Their eyes are black. Let's see how that'll look edited into the logos. The mascot looks a little creepy - I guess it's probably a rule of thumb when making a cartoon character not to give it black dead eyes - but otherwise the birds aren't so different. The pink legs may be a distraction, but a small price to pay for scientific accuracy! I've said it before and I'll say it again: the Baltimore Orioles are in a class by themselves when it comes to bird-named teams. They're the only team that is also a full species name. 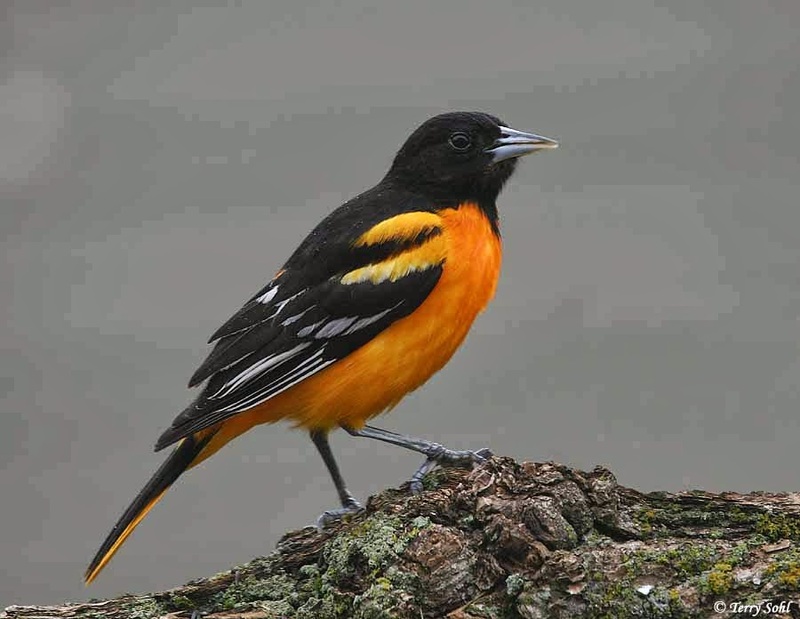 There are Baltimore Orioles and there are also Baltimore Orioles. It's incredible. Their logos, at least their primary logos, the ones with the realistic-looking bird, are equally remarkable. 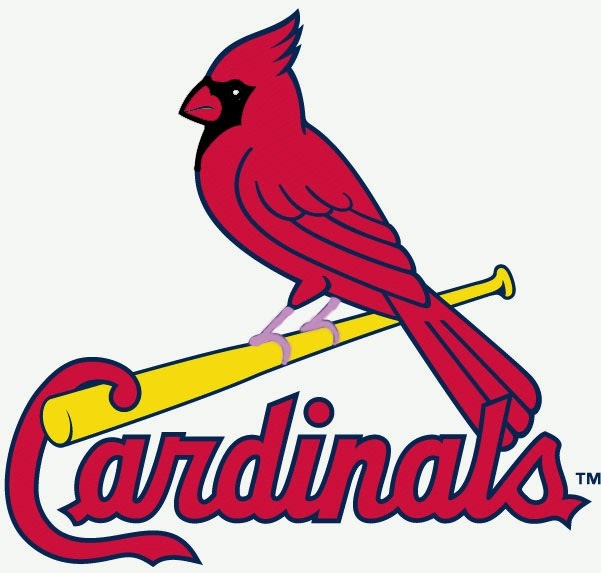 The birds are presented more realistically than any other bird logo in sports. Kudos, Baltimore. As the logos get more cartoony they get less accurate. 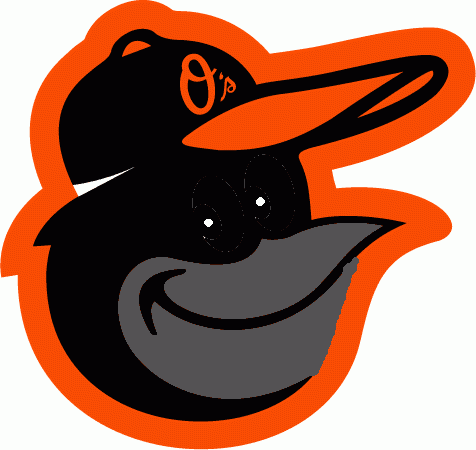 The cartoon mascots drop the accurate gray beak of the other logos in favor of a bright orange monstrosity. 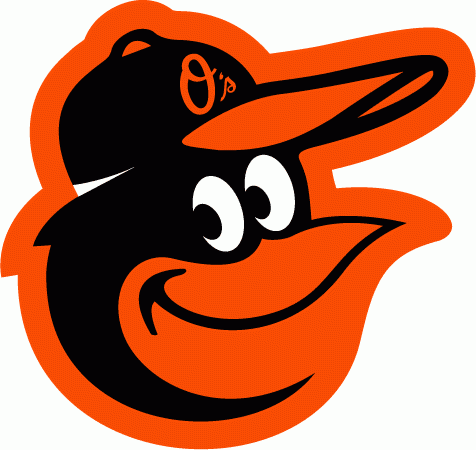 For the primary logos, the only change is that real Baltimore Orioles have gray legs, not orange. Here is what those changes would look like on the baseball team's logos. Again this the creepy black eyes! It's hard to get across in photoshop, I suppose. Note that I had to blue some work on the "batting oriole" logo to give him some white on the greater covers and the secondaries. Other than that, though, great work. Spring brings two of my favorite things back into my life: migrating birds and pro baseball. Welcome back. Have a good 2014.
haha Peter I'm not sure if you're being sarcastic but you sure have a cause to be. Photoshop is hard. I think the creepyness of the black eyes is from the fact that on the mascots there's no light eye ring to make the eyes stand out properly. Draw a white line around the eye to define it more and it gets better. Just my observation.